It`s peony flower season! 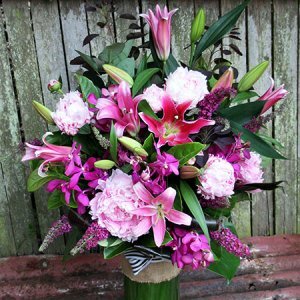 Celebrate with a beautiful bouquet featuring fresh pink peonies delivered Sydney wide. 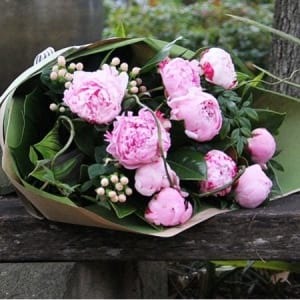 Peonies are one of the most popular flowers requested at Flowers for Everyone, and are much loved by people all around the world. In Australia, local peonies are available for a limited time over the summer period, starting around mid November/late spring. Many brides choose their wedding date to time in with peony availability! These fluffy beauties commonly come in pretty shades of pink and red, as well as classic white and a soft mauve, although pink peonies are our best selling colour for gifts. Their ruffled petals are luxuriant and they way they burst open from a tight round bud into a giant voluptuous flower is always a lovely surprise! Do Peonies Grow in Australia? Yes they do! Herbacious peonies are easy to grow in Australia, particularly if you live in a cooler weather climate. If the weather isn`t cold enough where you live, you can try to grow tree peonies, which are just as gorgeous. Once the Australian and New Zealand peony season is over, you will usually see a limited season during winter where imported Dutch peonies grace our bouquets and arrangements. 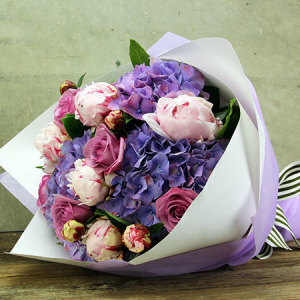 We deliver peony flowers Sydney wide via our online store and Sydney retail florist shops. 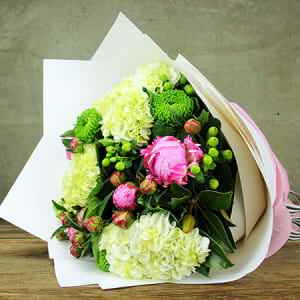 For peonies delivered outside Sydney, please call our team on 1800 66 66 46 or email sales@flowersforeveryone.com.au for availability and a custom quote. If you are after something specific that you can`t see online, please get in touch direclty so we can customise your order. Add a bar of Freckle Milk Chocolate or a ECOYA Sweet Pea & Jasmine candle, hand cream or diffuser with your peony bouquet for an extra special treat!